KINGSTON – I grew up in a household where the plum pudding was not just a dessert but an all-important Christmas ritual. On “stir-up Sunday,” the last Sunday before Advent, typically the last Sunday in November, my mother assembled the ingredients for her puddings, which included a small mountain of dried fruit, brandy and several dimes and silver sixpence. The whole family were called upon to stir the pudding mixture and make a wish. Then there was the cheesecloth and pudding basins and the practically ceremonial steaming of the puddings. For the month of December, the precious puddings were stored in the dark cool of the basement until Christmas Day when the pudding was brought out, re-steamed, and served set aflame for dessert, accompanied by rum butter. The latter was my absolute favourite part of Christmas dinner. It still is. And you can’t have rum butter without Christmas pudding. My father’s rules. I belonged in the do-not-love Christmas pudding camp, amongst all those others who believe that the Christmas pudding (also known as plum or figgy pudding) should quite rightly be set afire, and then preferably left to burn to ashes. The same for fruit cake and haggis and other similar foods, all best saved for an apocalypse. But my father was having none of that. “You’re too young for likes and dislikes,” he’d say, so I ate the Christmas pudding, liberally topped with my mother’s fabulous, decadent rum butter. In time, I came to love plum pudding, fruit cake and, yes, even haggis, adding credence to my father’s argument that I probably was too young to have likes and dislikes. Plum pudding has its roots in medieval English cooking, when there were few ways to preserve other than drying, salting or fermenting. Dried fruits, including raisins, prunes, figs, currants and apricots, were an important commodity in a time when sugar was an expensive luxury item and you could not simply run to the refrigerator or store for supplies. Dried fruit served as a preservative of sorts in many households, where the only sugar to be had was that contained in fruits. In its earliest origins, plum pudding contained ground meat as well as suet, grains, spices, salt and whatever dried fruits were on hand. This mixture, a cross between sausage and haggis, would have been encased in animal bladders or intestines for storage. Only later, when sugar became more commonplace, did the more contemporary version of plum pudding (sans meat) make an appearance. The same is true for mince pie. Plum pudding’s noble lineage was cemented in 1714, when a German from Hanover became the King of England. King George I, also known as the Pudding King, is said to have requested plum pudding for his first Christmas dinner in England. German-speaking George was an unpopular king when he initially arrived, speaking very little English. But he had one particularly endearing characteristic: he loved food and sharing it with others. He was the first king to be seen dining in public places and he held massive feasts and balls at Hampton Court, sometimes several times a week, using food and alcohol as a way to win over the British. In that same year that King George I came to the throne, 1714, the earliest known plum pudding recipe appeared in Mary Kettilby’s A Collection of above Three Hundred Receipts in Cookery, Physick and Surgery. By the Victorian era, plum pudding was a firmly entrenched British Christmas tradition. It had the virtuous benefit of being an egalitarian dish because although cast iron stoves had begun to appear in the most affluent households, the plum pudding being steamed and not baked, did not require the luxury of owning an oven. In 1927, the British Empire Marketing Board wrote to the Royal Household, requesting a copy of the Royal Family’s Christmas pudding recipe. The recipe was scaled back and ingredients from each of the colonies was included: brandy from Cyprus, nutmeg from the West Indies, Australian currants, South African raisins, Jamaican rum, English beer and Canadian apples. Thousands of copies of that recipe were circulated, making the plum pudding popular all over again. 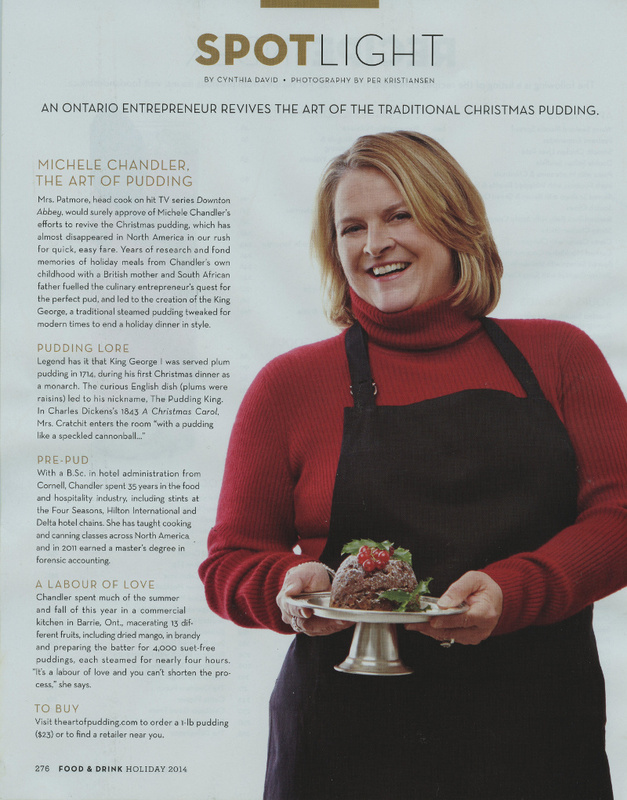 This year, instead of making the pudding, I have a beautifully boxed King George Christmas Pudding made by The Art of Pudding, a Toronto-based company owned by food entrepreneur Michelle Chandler. Chandler has already done all the work, including developing the perfect recipe, gathering the lengthy list of ingredients, and prepping and steaming the puddings for four hours. The boxed one-pound puddings contain, among other things, raisins, currants, apples, dried figs, candied peel, cherries, dried apricots, mango and pears, and brandy. The puddings can be lightly re-steamed on the stove top or warmed in the microwave. A recipe for hard sauce is included. The puddings can be purchased in Kingston at Cooke’s Fine Foods (check website for other locations throughout Canada) or ordered online and shipped anywhere. A perfect holiday gift for any foodie on your list. For more information, go to theartofpudding.com. Lindy Mechefske is the award-winning author of Sir John’s Table and A Taste of Wintergreen. You can find her blogging about her adventures in the kitchen at lindymechefske.com. Using a hand-held mixer, beat the butter and brown sugar for several minutes. Add the rum, slowly, and keep beating until it is fully incorporated. Store in a sealed glass jar in the refrigerator. If the rum separates, don’t worry, just give it a good stir prior to using. Serve with plum pudding, mince tarts, apple crisp or a tart apple pie. ‘Tis the season to splurge on small-batch chocolate, swank kitchen tools and coffee-table-worthy cookbooks. I remember childhood Christmases in New England. Snowflakes in my face and angels in the snow. The forever waiting for all good things like Santa’s presents and the huge turkey dinner with family and friends. I waited patiently- well not so patiently, really, for dessert. I knew what it would be and it only came once a year. It was Christmas pudding with the brandy flames dancing around the platter. The flames warmed the spicy cake with the sweet, rich fruit wrapped inside. I used to let the soft parts melt and the chewy parts linger. That way I could make each mouthful last that much longer. Now my long ago experiences live again. My friend, Michele Chandler, has created a plum pudding fit for a king. In fact her creation is called the King George pudding, celebrating the comfort and joy of this tradition which began as Christmas dessert in the court of this English monarch in the 1700’s. Ms. Chandler’s plum pudding is one pound of pure heaven containing many dried and candied fruits including figs, raisins, mangoes cherries and apricots. Fully one quarter of the dessert is fruit, making it much softer and moister than its cousin, the fruit cake. The rituals which surround plum pudding add to the anticipation. Traditionally, plum pudding is prepared months before the Holidays. Brandy or other liquor is poured over the dessert to steep and blend the flavours. Then it is gently steamed before serving to enhance its aromatic charm. The flambe presentation adds to the drama. The warm pudding is served with hard sauce, a flavoured, fluffy butter-sugar topping which gently melts over the tender pudding. Fit for a king, indeed! The King George plum pudding has been a long time in the making. Ms. Chandler, who has a history in hospitality and food service, took years to perfect her creation. Starting with her British tradition, she prepared plum pudding as a favourite activity for family and friends. She has grown her talents into a successful company, The Art of Pudding. Michele has been unrelenting in her search for the best ingredients, recipe and preparation. The result is a unique dessert which tempts us all. This season she anticipates sales of over 4000 puddings. Ms. Chandler’s pudding is now retailed through a number of speciality shops in the greater Toronto area as well as upstate New York and New England. With its attractive packaging, the pudding makes a great hostess gift and travels well to send some Christmas cheer to distant family and friends. The King George pudding may also be purchased on line. Visit www.theartofpudding.com for more information. We only celebrate the Christmas holidays once a year. This year why not celebrate an old tradition or start a new one? Own and experience the King George pudding. Add some comfort and joy to your holiday meal. SKANEATELES | When visitors to the 22nd annual Dickens Christmas stop at the Mid-Lakes Navigation storefront to taste some figgy pudding, they won’t be putting food just in their mouths. Through a partnership with the Skaneateles Ecumenical Food Pantry, The Art of Pudding — the Canadian company that offers samples and sells containers of its King George figgy pudding — donates the proceeds from every sample to the food pantry. Suggesting a contribution of 25 cents per sample, Michele Chandler, the company’s owner, said she sent a check for $375 to the food pantry in 2013 — the first year the puddings appeared at Dickens — and last year cut a check to the food pantry $750. This year, Chandler wants to give $1,000 to the food pantry and hopes the community joins her in taking part in a British holiday tradition and in supporting a community organization. The pudding samples are available at Mid-Lakes from noon to 4 p.m. every day of the festival except Christmas Eve, Chandler said. In fact, food pantry volunteers will help staff the sample table at Mid-Lakes the weekend of Saturday, Dec. 5 and Sunday, Dec. 6. The partnership between the pudding maker and the food pantry began, Chandler said, because “the festival grew so much” that Chandler and her assistants could not keep up with the demand of offering free samples and knew they would have to charge people to take the figgy morsels. So, rather than pocketing the money, they decided to turn it into a charitable venture so that people are not just coming into Mid-Lakes for a free dessert and are helping out a worthy cause in the process. She noted a quarter for a sample can sometimes turn into a $20 bill from a generous taster, and she credited Mid-Lakes staff for both providing the location for the pudding and for helping oversee the process. In her third year of bringing figgy pudding to Dickens Christmas, Chandler said she enjoys sharing the tradition of the British holiday desserts as much as helping out the food pantry. She noted that Sunday, Nov. 22 was Stir-up Sunday — the informal name for the last Sunday before Advent — and it is a day in which British families spend time together making pudding in the kitchen as they prepare for the holiday season. One of the customs of figgy pudding, she said, is to insert a silver coin into the dessert. Whoever finds the coin is said to gain wealth and health for the following year, and Chandler said the royal mint issued special silver sixpence pieces this year to get people back into the pudding tradition. “As children, we used to rip the pudding apart trying to find the money,” Chandler said. Though The Art of Pudding does not put coins in its puddings, she suggests people who buy one — containers are available at Vermont Green Mountain Specialty Co. in Skaneateles — put in a coin in themselves. But, since coins nowadays are made of alloys instead of precious metals, she suggests wrapping the coin in parchment first. Another pudding she suggests people try is to pour alcohol over the dessert, light the concoction on fire and make a wish as the alcohol burns off. Chandler called figgy pudding “a warming dessert,” both literally and figuratively, because of what it means to people and for the season. “It goes really hand-in-hand with what the season is all about, which is gratitude,” she said. Chandler said the King George figgy pudding continues to grow in popularity both at Dickens Christmas and around North America. The pudding is available throughout Canada and the northeastern United States, particularly in stores in New England and New York City, she said. The pudding is also sold online, and she has shipped pudding as far away as Alaska, Texas and Los Angeles. For Dickens, people from as away as Rochester contacted her to see if she was still offering pudding samples. And a sign that hangs at Mid-Lakes during the festival — reading “Get Your Figgy Pudding” — has turned into the place to go for people to take selfies of their Dickens experience and post those photos on social media. Charles Dickens and his cast of characters even stop by Mid-Lakes on the weekends to get their fill of figgy pudding, Chandler said. Skaneateles Journal Editor Jonathan Monfiletto can be reached at jonathan.monfiletto@lee.net or (315) 283-1615. Follow him on Twitter @Skan_Monfiletto. 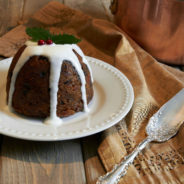 Web chef, Kimberly Turner, from http://CookingWithKimberly.com shares with you what she has to Say About…The King George Christmas Pudding by The Art of Pudding available at Harvest Barn Country Markets! Be a Champion in Your Kitchen & Eat Deliciously! Cooking With Kimberly is Made in Niagara! Are you? List your Biz: http://MadeInNiagara.info/list-your-biz! But unlike brick-like fruitcake, which is generally more batter than fruit, the best pudding sports a ratio of equal parts fruit and nuts to batter and a moist, nuanced crumb. Its texture is aided by a process of steaming and an aging period of hours to months. “You’d never serve a pudding fresh from the oven,” says Michelle Chandler, a former business consultant who started producing and selling her own puddings under the brand name The Art of Pudding last year. For decades, she has served one – doused with brandy and set alight tableside in a dim room, its blue flame licking the edge of the plate – as the pièce de résistance of every Christmas feast. For modern tastes, says the food stylist and recipe developer Michael Elliott, beef fat won’t cut it, nor the obscene amounts of sugar found in some heirloom recipes. That’s why, when imagining a slew of updated puddings for this story (including a surprising savoury version), Elliott used lots of fruit, both fresh and dried, decoratively and, more importantly, in the batter. “That’s a great way to have a sinful dessert but also maintain lightness,” he says. In the case of his “traditional” pudding, Elliott even eschewed heavy winter spices for citrus peel, almonds and fruit soaked in brandy and port. Conventionally served with a sugar-laden “hard sauce” (a potent mélange of butter and booze) or eggy custard, another way to lighten the load is to serve pudding with crème fraîche or whipped cream, Elliott says. “That will give you the dairy content without going for the 45 per cent milk fat.” Chandler agrees, although she points out that diners should probably just save room for one final, decadent course. “My pudding is never going to be a health food,” she says, laughing. The key to cooking a perfect pudding is mastering your steaming technique. The instructions below can be applied to most recipes, including the four sweet options featured. Preheat oven. 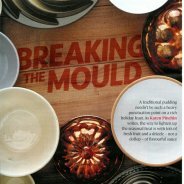 After pouring your pudding into a pudding basin or heatproof bowl, crumple and wet a piece of parchment paper, then spread it flat. Place the parchment atop the filled pudding vessel. Cover with a piece of aluminum foil. Secure the foil and parchment with butcher’s string. Place the pudding in a Dutch oven or deep heatproof container. Place in the oven, then fill the outside vessel with boiling water until it reaches halfway up the sides of the pudding basin. Cook as directed.